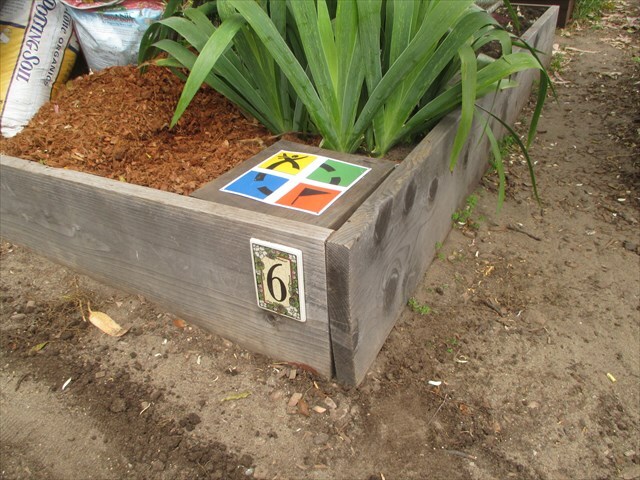 The cache is in a private plot in a community garden. It is in a 5 gallon plastic bucket, buried in the dirt with a square wooden board on top of it. Remove the board and spin the dial counter-clockwise to remove the top of the bucket. Inside is a smaller bucket containing the actual cache, the log book and trackables. Please replace the smaller bucket inside the larger bucket when you are done, put the lid back on, spin it clockwise to secure it, and replace the board on top of it. Thanks! Welcome to the oldest continuous cache in San Francisco County! 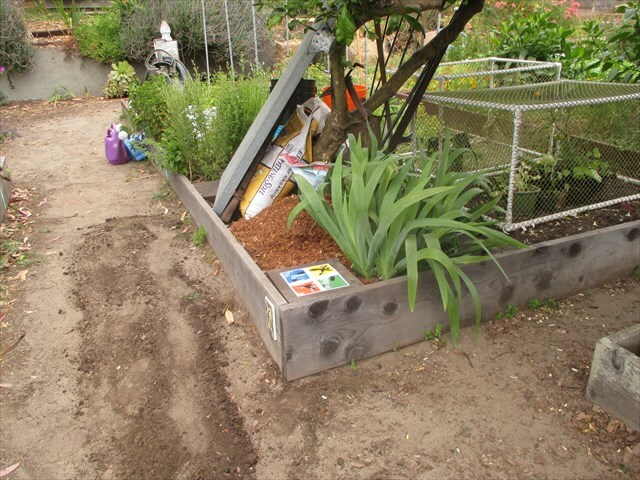 The cache is in a private plot in a community garden. It is in a 5 gallon plastic bucket, buried in the dirt with a square wooden board on top of it. Remove the board and spin the dial counter-clockwise to remove the top of the bucket. Inside will be a smaller bucket containing the actual cache, the log book and trackables. Please replace the smaller bucket inside the larger bucket when you are done, then put the lid back on, spin it clockwise to secure it, and replace the square wooden board on top of it. Thanks! Please be very respectful of the other gardeners and their plots. Do not walk in any of the plots, and please do not pick anything or leave any litter. Having said that, this garden is situated in a National Park, on public land, and is open to the public at all times. You have every right to be there! I consider this geocache a community service and an asset to the park, and I personally welcome you to visit the community garden! Please feel free to sit there and have lunch at the picnic tables, and enjoy the surroundings. The cache was stolen sometime between May 7 and May 12, 2017 and was replaced on May 30th. All trackables in the cache were lost unfortunately. Also, if you are thinking about dropping a trackable here, please know that they do have a tendency to disappear. Not sure why. As of May 30, 2017 we are homing in on 4,000 unique visitors! We will have a picnic in the garden later this summer, follow this cache for updates. All are welcome! July 20, 2014 - we are homing in on 3000 unique visitors! August 11, 2012 - congratulations to LadyLeo191 who is the 2,000th geocacher to log a successful find of the Green Thumb cache!!! It took just over 8 years for the first 1,000 geocachers to find it, and just over three years for the next 1,000. I don't know if that's because geocaching is catching on, or because Green Thumb is on a lot of "favorites" lists - but in any event - woot! February 9, 2011 - coming up on 1,500 visitors! July 12, 2009 - Congratulations to bunkyboo, the 1000th geocacher to log the Green Thumb cache! July 19, 2009 - met with the delightful bunkyboo family to give them their swag for being 1000th to log the cache. Hopefully they'll log some photos of the "event." Prizes donated by groundspeak.com include book ("The Idiot's Guide to Geocaching") and a really neat geocoin, plus some other stuff. Gur pnpur vf va cybg #6. Gurer vf n znc ba gur xvbfx va gur pragre bs gur pbzzhavgl tneqra. Bgurejvfr, urnq gb gur AJ pbeare bs ybjre frpgvba bs gur tneqra. Gur cybg unf n ynetr yrzba gerr va vg. Gur pnpur vf va gur FJ pbeare bs gur cybg. Closeup of Cache SiteCache is underneath the board with the GeoCaching logo on it.